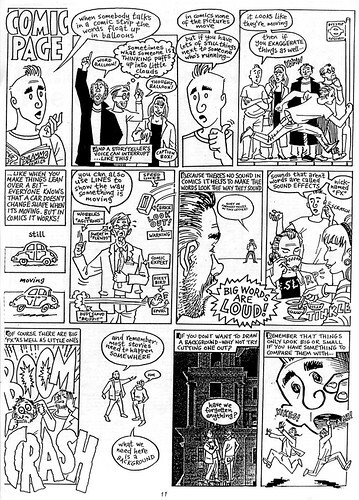 The late, great Steve Whitaker drew this guide to creating comics back in the 1990s and it's available online via Flickr if people want to use it for teaching purposes, published under a Creative Commons license. Printed in the Society of Strip Illustrators newsletter for September 1992, it's a terrific instructional page about how comics works that was presumably intended for use in the London Cartoon Centre classes which Steve ran. Strangely, this is the second time Steve has cropped up in online happenings for me this week: this time it's the result of an appeal by Bryan Talbot, who plans to use the art as part of a presentation on comic storytelling next week to a secondary school whose, pupils are doing a graphic novel on their local history inspired by his graphic novel, Alice in Sunderland. Tonight (Thursday 14th January) sees the opening of an exhibition of art by 2000AD contributor Arthur Ranson at London's Orbital Comics. The exhibition spans his 30-year comic career: Arthur's credits are numerous, including, of course, "Button Man", "Judge Anderson" and "Mazeworld" for 2000AD; but also strips such as "Sapphire and Steel" and "Buck Rogers in the 25th Century" for the Junior TV Times title Look-In (sadly, no longer published). His first ever strip appeared in that title - "Les Dawson - Superflop" but other credits on that comic include "CHiPs", "The Beatles", Dangermouse" and "Michael Bentine's Potty Time". As well as his work for 2000AD, he's drawn issues of Batman - Dark Legends for DC Comics; and X-Factor and Xtreme X-Men for Marvel Comics. Arthur recently launched his own web site and is currently on the hunt for examples of his work for Look-In. "For completeness I would like the Look-in section to have an example of every strip I did for them," he says, but "Due to not having access to some of the work this is presently not possible." If any one out here has examples of unrepresented strips - The missing titles are "Doctor on the Go", "The A-Team", "Logan's Run", and "CHiPs" - they could be emailed to the contact address on the web site. "A "Worzel Gummidge" and a "Just William" pic with the eponymous hero in would be nice too," says Arthur. In December, Arthur posted a sort update on the much-rumoured Button Man movie, based on the 2000AD strip created by John Wagner. "Despite what you might see on the internet, there is not as yet a Button Man movie, not even one starring Leonardo di Caprio," he noted. "Dreamworks have a few months to decide whether to either go ahead, pay for more time to decide, or drop it. You will be informed." Comic creators across the globe are already coming up with ideas to help raise money for the Haiti Earthquake disaster - if you're a British creator or retailer who's doing something, let us know and we'll try and plug it here as soon as we can. Please include your name, address and telephone number in any such correspondence - sadly, we gather there are already people out there scamming people who genuinely want to help. The comics medium already helps Haiti: comics have been used, for example, to help combat illiteracy. The Disasters Emergency Committee Haiti Earthquake Appeal is to launch with the support of major UK broadcasters including the BBC, ITV, Channel 4 and Al-Jazeera. The money raised will support the efforts of the DEC’s members which are the major UK aid agencies. They expect the appeal to be broadcast on Friday but donation lines and the website are already open for donations. Tube Surfing: Ro-Jaws, Rebellion, Crikey!, Rankin, Road and Comic Fairs! Ro-Jaws returns to 2000AD this week, making a comeback in the A.B.C. Warriors strip by Pat Mills and Clint Langley, who also provides the cover for Prog 1667, right. • Talking of 2000AD, parent company Rebellion is undergoing something of a restructure, and part of the move puts the staff at its Derby studio under consultation as the lease on that studio expires. Develop Daily reports the firm is still committed to growing the staff at its Oxford HQ and expand its Runcorn base. Rebellion Derby had most recently worked on completing Bethesda's Rogue Warrior. Its sister studios are hard at work finishing the new Alien vs Predator for Sega. Expect more news in coming weeks as to what this will mean for the games company. • Novelist Ian Rankin was presented with West Lothian Libraries' Scot Scriever Award on 12th January. At his presentation ceremony he talked about how the local library in his native Fife had been a big draw for him as a youngster before he went on to talk about his career and take questions from the audience. When he was asked what he was reading at the moment he immediately said the latest Broons book and went go to give the examples of Granpaw Broon getting an ASBO and the wind turbine that now overlooks their But An' Ben holiday cottage as how the Sunday Post's strip, that has been running for almost three quarters of a century, was remaining contemporary. • Sgt Mike Battle #14 is out now and sees the whirlwind romance between Roger Knightly and Shapely Charms reaches its thrilling finale. Can you really afford to miss the most shocking and heart-wrenching story in the history of comics? Do not worry about crying your eyes out as you read the comic because for a limited period you will get a free tissue with every issue! • Good news from the publisher of Crikey! After concerns that the Borders collapse would damage the format of the title, we can report that despite earlier concerns it might have to black and white throughout, Crikey! 13 will have a centre section of eight pages in full colour. Discussions about expanded distribution through other retail outlets is also looking more positive. • British Comic Creator Eddie Sharam got in touch with us lately, drawing our attention to the webcomic ROAD over on Zuda, which he writes and draws and will soon pass an impressive a 100 page milestone. He's been at it for over a year, with another year planned out. You can read ROAD on Zuda.com for free at zudacomics.com/road and Eddie would welcome feedback. • And finally... here's a list of upcoming Golden Orbit comic fairs, which I hope to get chance to add to the events listing soon. All events start at midday apart from Leeds. • Saturday, January 16, Birmingham - The Nautical Club, Bishopsgate Street, off Broad Street and a short walk from Smallbrook Queensway. Vworp! Vworp! It's a New Doctor Who comics fanzine! A non-profit-making, full-colour glossy 80-page perfect-bound fanzine that, in the words of Paul Scoones (author of the forthcoming Doctor Who Comics Companion), "sets a high benchmark for fanzine production standards", the magazine is simply packed with plenty of interesting Doctor Who comics background and other material. It includes an interview with founding editor Dez Skinn, discussing the birth of Doctor Who Weekly; and a guide to the creation of the first Marvel Doctor Who strip, "The Iron Legion", with input from Dave Gibbons and Pat Mills and contributions from Dez Skinn, David Lloyd and Leon Hewitt, including the never-before-seen original pitch document, fully annotated and dissected. The zine also features several new comic strips: "Time Leech", written by Kasterborous‘ own Christian Cawley, art by Justin Abbot; and "The Master’s Life on Mars" by Gareth Kavanagh and John Daiker, with art by John Daiker; "Clash of Empires" (Silurians vs Ice Warriors), written and drawn by Daryl Joyce. In addition, David J. Howe revives Collectors’ Corner, a DWM regular feature for one final outing, while Dave Gibbons, Pat Mills, Steve Lyons and Gareth Kavanagh are "Nailing The Star Beast", going on the trail of our own favourite furry supervillain, Beep the Meep; and there's also a feature on "The Cybermen", exploring possibly the most esoteric of the Who strips, the Cybermen strips from the mid-1990s. This features interviews with writer Alan Barnes, artist Adrian Salmon and editor Gary Russell, plus an appreciation from Matt Badham and a lost instalment completed for the first time. Only 1000 copies are being printed. 900 copies will have a wonderful wrap-round artist mash-up cover, pulled together by Colin Brockhurst and Ben Wilsher from an original concept by Ben and Roger Langridge. Essentially, it’s a jam session between fourteen of the finest artists in Who comic history: Baxter Sullivan (1st Doctor), Roger Langridge (2nd Doctor), Ben Willsher (3rd Doctor), Adrian Salmon (4th Doctor), Dan McDaid (5th Doctor), Sean Longcroft (6th Doctor), Lee Sulivan (7th Doctor), Martin Geraghty (8th Doctor), Mike Collins (9th Doctor), Rob Davis (10th Doctor) and Leighton Noyes (11th Doctor), with cameos from Dave Gibbons, Dicky Howett and John Ridgway. However, being nostalgic the production team have also prepared a single variant cover to be featured on 100 copies (not 100 different ones – that would be a logistical nightmare!) and is intended as a loving homage to the original Doctor Who Weekly covers (se above). Featuring a marvellous CG Malevilus by Gavin Rymill, it depicts a 1978 ‘publicity photo’ from an imaginary TV version of "The Iron Legion". The first cut was pulled together by Dez Skinn (Doctor Who Weekly’s inaugural editor who, of course designed the original DWW covers in 1979) and then polished by Colin Brockhurst to create something that is guaranteed to send a shiver up the spine of any Who fan of a certain age. The back cover’s is by 30 Days of Night, Fell and Wormwood artist Ben Templesmith! As if all that wasn't enough, both covers also feature a set of transfers (yes, real rub-down transfers just like the ones on Issue 1 of Doctor Who Weekly 30 years ago) specially drawn by Paul Grist (with colours by the sublime James Offredi), complete with a matching scene of the Daleks on Skaro to apply them to! This is surely going to be one of the most sought after Doctor Who fanzines ever - so pre-order a copy as soon as you can! • Vworp! Vworp! costs £5.99 (P&P not included) and the zine will be available from late January: pre-order it now from the Colin Brockhurst's web site. It will also be on sale from specialist retailers. The Book: It's coming up to Halloween and already Glister's father is bustling around getting ready for Christmas! The Butterworths are putting up decorations for the tree and making preparations for the big day, but Glister is sad – her mother is missing and Christmas just wouldn't be the same without her. She's determined to find her mum and solve the mystery of her disappearance. The Review: This is the third book in a quirky, funny series for girls starring Glister Butterworth – girl-magnet for the weird and unusual. Glister and the Faerie Host draws on Greek myth (the legend of Persophone springs immediately to mind) and the concept of a physical Faerie world in our own you can visit if you dare we've seen else where (Neil Gaiman's Stardust, for example, but there are many others). While this might seem like treading old ground, Andi Watson, whose recent credits include work for Image and Marvel, has drawn on many rich folklore elements and created a wonderful new world with his own Glister series - tales aimed at young adults I'd argue were ideal for getting them "into" comics, as well as being superb stories in their own right. In this latest tale, Glister takes on the Faerie King to find her mother, braving the worst the kingdom of the Faerie (now nearer to home thanks to Council boundary changes!) can throw at her. The art is gorgeous: some of the scenes - even quiet ones, where Glister is talking to her mother's 'ghost' in her bedroom - are lovingly rendered, and the scripting is knockout. (Andi's description of the coming autumn, for example - a small thing, but fab - and the whole sorry tale of how Glister's mother went missing in the first place. There are also some great extras in the book (you can find more Glister extras on Andi's LJ blog, and on the Walker Books web site), including "Glister Vs The Toll Troll" and "Home to Roost", two short stories. All in all it's a great little package for little hands, as well as soppy old gits like me blown away by decent storytelling. Glister and the Family Tree is the next in the series and it's out on 1st March. Can't wait! Monday, 11th January is National Human Trafficking Awareness Day in the US. To participate, a number of comics creators including Heroes Inc. creator Scott Austin, writer Peter David and X-Men artist J.K. Woodward - formed the Comic Creator's Alliance - a group of over 80 comic book creators (both web and print) who volunteered their artistic talents to raise money and awareness for this cause. You may not know it, but there are currently 27 million enslaved people worldwide - more than double the number of enslaved Africans during the trans-Atlantic slave trade. UNICEF estimates that 1.2 million children every year are sold into slavery, most of it sexual. The US Department of Justice estimates 16,000 victims of human trafficking are brought into the United States every year. Unlike slavery in the 19th century, what is happening today is happening in secret. So it won't end until awareness is raised, and people need to take a stand. So here's what the comic creators - all listed here - did: each of them contributed an original drawing of one of their own female characters, and combined them into a single wallpaper image. The preview featured above is just a small snippet of a simply gorgeous montage intended to raise money and awareness for an important cause. The wallpaper features characters from The Phoenix Requiem, Girls with Slingshots, Earthsong, Looking for Group, Shadowgirls, Marsh Rocket, The Uniques and three IDW Publishing titles: Fallen Angel, The Dreamland Chronicles and The Dreamer, and lots, lots more. To get hold of a copy, all you need to do is donate to the cause via the CCA website and download this unique, once-in-a-lifetime wallpaper. The Donations Drive will last for two weeks, from 11th - 24th January and all proceeds will be split evenly between Love146 and Gracehaven House - two organizations working on rehabilitation of victims and prevention of this crime. • To learn more about the Comic Creator's Alliance visit www.comicalliance.weebly.com.